Gossip Stone: Who Is Your Favorite Dragon Boss in the Zelda series? When it comes to stories set in a medieval or pseudo-medieval setting, soon or later you’ll run into dragons. Either in the flesh or just referenced, there is something primordial, something alluring to large serpentine monsters. Many cultures who have had contact of some kind with scaled creatures from snakes to crocodiles have eventually developed a large and mighty variant of it: from the Chinese Dong Fang Qing Long (The Azure Dragon of the East), the Iranian Zahhak (known as Aži Dahāka in Zoroastrianism) and the many dragons slain by heroes and saints in Europe, there is something irresistible about dragons. They can make for either benevolent sages (more common in Eastern depictions) or very intelligent and lethal predators (more common in Western depictions). While Link has met a number of benevolent dragons in Wind Waker and especially Skyward Sword, he has put a lot more of them to the sword over the course of his adventures. But who is your favorite? Read up on them after the break and decide for yourself! If you asked a fan to name a dragon in the Zelda series, they’d likely name Aquamentus. 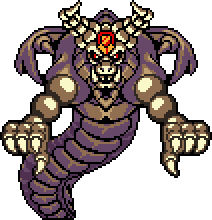 The first boss you face in the original game and in Oracle of Seasons, it is also one of the wimpiest bosses in the series. 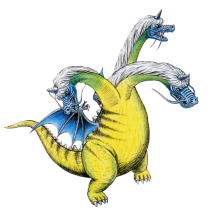 Aquamentus is a “true” Western dragon, with four legs, wings, a horned head, a breath attack and wings. Interestingly enough the dragon’s horn is much like that of a unicorn, a single horn sticking out of its forehead. It is the dragon’s primary weak spot: hit it enough times and the beast will go down. Aquamentus’ primary method of attack is a magic breath attack aimed at Link, who can either dodge or block them with a magic shield. In Oracle of Seasons it has an additional attack: it will charge across the room in an attempt to tackle Link. But between these attacks Aquamentus is very slow and its weak spot is easy to approach, making it not much of a threat. Even compared to other first dungeon bosses such as Gohma, Odolwa, Diababa and the Armos Knights are nowhere near as wimpy as Aquamentus. Aquamentus also appears in Game & Watch Zelda. Though it goes by the name Dragon and does not look like it does in the core games in-game, the image in the manual (seen to the right) makes it look just like the dragon we all know. Aquamentus also appears in the cartoon, but like many other characters in it Aquamentus does not look the part. 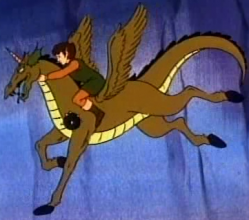 Instead it resembles a pegasus dragon, which is makes it look rather goofy. But then again, what isn’t goofy in the series. Gleeok appears in the first game as well. It is the boss of the fourth and the eight dungeons and a miniboss in the sixth. It resembles a multi-headed dragon with a plump body, two hind legs, a pair of wings way too small to carry something that big and one to four heads. The multiple heads suggest it is more akin to the Hydra of Greek myth, but in the series it is considered to be a dragon. Gleeok is one of the few bosses in the series who changes as you fight it throughout the game, but unlike bosses like Ghirahim who gain new attacks and such it gains more heads to attack you with. Link fights the dragon by dodging the fireballs it breathes at him and chopping off its heads one by one until none are left. But this does not destroy the heads: instead they fly around and continue to breathe fire at him. With the heads flying around this is more of a challenge to dodge: they can attack from many different angles instead of the limited ones while the head is still stuck to Gleeok. Link faces it again in The Faces of Evil, where it has stolen a necklace and Link has to recover it. In Oracle of Seasons Gleeok returns with a twist: when both its heads are gone its body starts jumping up and down in an attempt to crush Link. He has to dodge the shockwaves with the Roc’s Cape and strike the body while it is stunned until it goes down for good. In Phantom Hourglass Gleeok appears in a slightly different form: it has two heads that breathe fire and ice at Link. This turns the battle into something reminiscent of the various Twinrova battles: by bouncing the fire attacks into the ice head and vice versa Link can destroy the armored masks the dragon’s heads wear. Then by tying their tongues to poles in the boss arena the hero can draw the heads close enough to strike with his sword and destroy them. There’s also a boss named Gleerok in The Minish Cap, but it is fought completely different than Gleeok. In The Adventure of Link the boss of the sixth dungeon is a fire dragon named Barba. It is a great fire serpent that pops up from the lava in the boss room and breathes fire at Link. 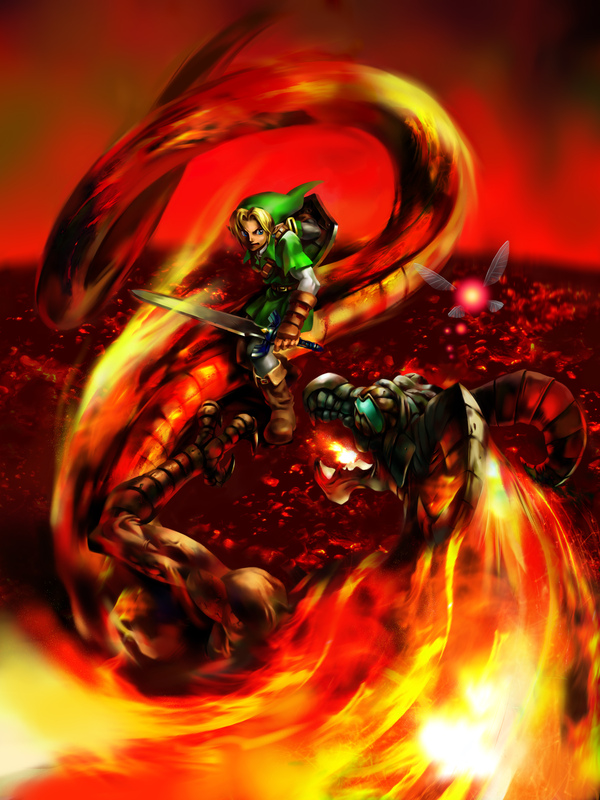 By dodging the fire and using the Jump spell Link can get up to its head and strike it with his sword. It might not seem to be a dragon, but Barba in fact is: in Japan it is named Barubajia. In Japan the B and V sounds are more or less the same, making it a possible mistranslation that was dropped in Ocarina of Time. Here they translated it as Varuvajia, known in the west as Volvagia. 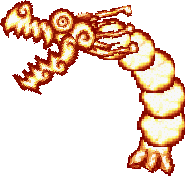 A fiery version of a Chinese dragon, Volvagia uses a combination of fire breath, dropping rocks and physical attacks to defeat the hero. Link can beat the dragon by waiting for it to pop up from one of the lava holes, dodge the swipe of its fire hair and stun it with the Megaton Hammer, following up with hitting it with his sword. Volvagia makes something of an appearance in Hyrule Warriors as well, inspiring the looks and abilities of the dragon knight Volga. Onox, the General of Darkness is the main antagonist in Oracle of Seasons. While he looks like a Darknut for most of the game it is not his true form. After Link beats his first form at the end of the game he reveals that he has been summoned from the Dark Realm (which later reappears in Spirit Tracks) and that his true form is that of an evil-looking dragon, tending more towards a Chinese dragon rather than a Western one. He breathes fire at Link and tries to crush him with his claws. By jumping onto the back of his hands Link can reach Onox’ head and strike it with his sword. While it makes for a good final battle it is a lot less difficult than the final battle of a Linked game against Twinrova and Ganon. In an interesting fact, the fight with Onox quite possibly inspired the final battle in Mega Man X, where you fight the final boss in much the same way except it has been made a lot more difficult because the boss shoots from its hands as well. 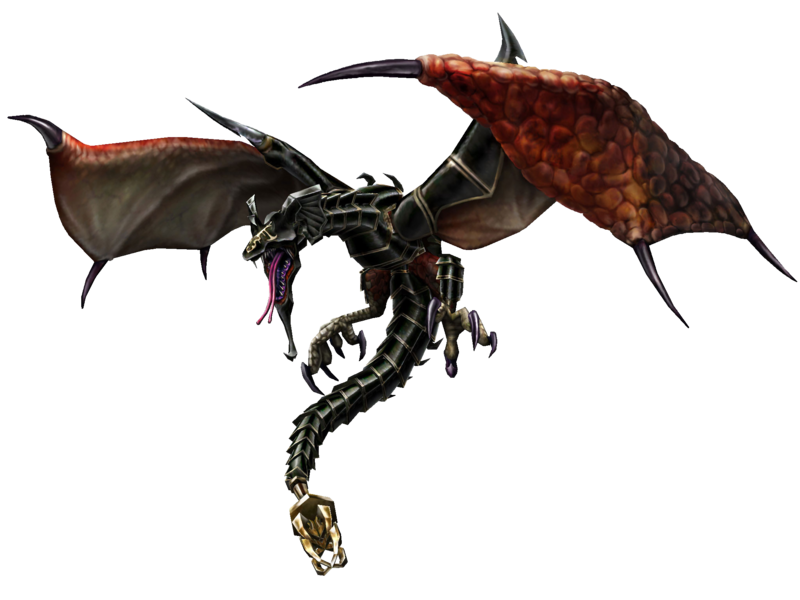 Twilit Fossil Stallord is the boss of Arbiter’s Grounds, the first dungeon of the second half of Twilight Princess. Awakened by Zant in an attempt to kill Link, the dragon sits in the center of a sand pit and sends his skeleton army to kill the hero. By riding the Spinner and dodging the Staltroops Link can cross the sand and aim for the dragon’s spine. Striking it will break a vertebrae, and doing this three times defeats the dragon… or so it seems. This starts the second part of the fight where Link has to ride the room’s central pillar upwards and jump to the opposing wall to dodge the attacks of Stallord’s flying head. He also has to dodge Blade Traps that become more frequent the more damage Stallord is dealt. When he gets close enough Link can hit Stallord out of the air and expose its weak spot for him to hit with the Master Sword. The flying head phase of the fight might remind one of the fight with Gleeok, who has been fought earlier in the series. Stallord also appears as the final boss of Link’s Crossbow Training where itlacks the sword in its head and instead has 10 horns instead of four. Twilit Dragon Argorok guards the last part of the Mirror of Twilight in Twilight Princess. Its name is not entirely correct since it is a wyvern rather than a dragon because its wings are its forelimbs rather than having four legs. For the rest it meets the requirements of a dragon: winged, breathes fire and is antagonistic towards the Oocca of the City in the Sky. Fighting it involves using the Double Clawshot by grabbing onto it and either dragging it down by using the Iron Boots or hitting the weak spot on its back and damaging him that way. Argorok also appears in Hyrule Warriors as a boss monster. Here it has to be pulled down by either Lana’s, Midna’s of the Great Fairy’s magic to put it within range of the heroes’ weapons. It’s name is likely a mix of the old term Argo- to indicate the ancient Greeks and –rok, used for certain dragon type enemies alongside –ok. While this sums up the dragon bosses in the main series, there are two in games not part of the main series. Dora Dora is fought in Freshly-Picked Tingle’s Rosy Rupeeland. Fought at the end of Desma’s Labyrinth, Dora Dora is a big lava dragon that breathes fire at Tingle. By dodging its attacks and the magma that slowly rises in the mountain it is fought in Tingle has to make his way to the top of the mountain. If he reached the summit the build-up of magma causes the volcano to explode and launches the two of them into the sky. But since it’s very cold up in the air the dragon’s burning body cools down rapidly and breaks apart, turning into 60.000 Rupees for Tingle to collect as he falls back to the earth. Which he (un)fortunately survives because of ill-defined reasons. That sums up all the dragon bosses and dragon-like bosses you fight in the Legend of Zelda series. Be sure to vote in the poll and let us know your thoughts in the comments below.